Kilkenny, the general aspect of which is hilly, but the elevations are seldom so precipitous or severe as to preclude the operations of the plough. The marble and coal of this county take rank as its most valuable productions. Mineral waters are found in several parts of the county; the most celebrated is termed the Spa of Ballyspellan, and situated in the parish of Farlagh. The banks of the Nore often present much pleasing scenery, particularly near the bridge of Ballylurch and the town of Ross. The lovely scenery on the banks of the Suir is truly worthy of the traveller’s investigation. The county returns two members. 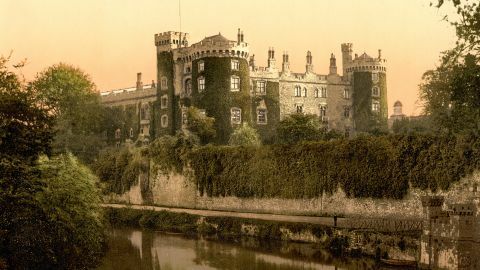 This old capital of the “Pale.” or limit of English authority, was founded by Strongbow 1172, and is now the chief town of Kilkenny county, on the river Nore, which is crossed by two bridges uniting it to Irishtown on the east side.